Gemix is an online video slot games powered by Play’n Go software platform. 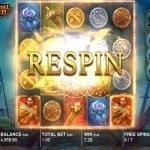 This slot games is about 1 payline and 7×7 reel grid. 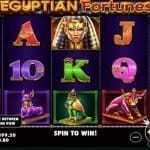 This slot is very popular among players because of the symbols and features involved in it. 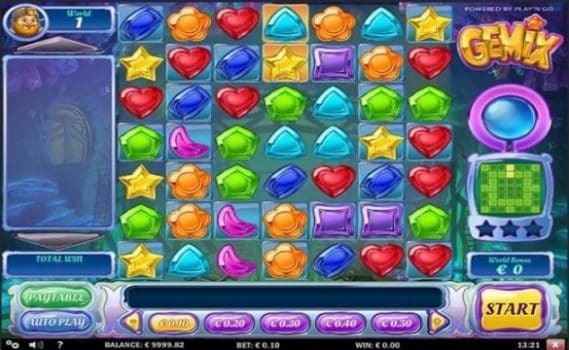 This slot is inspired by beautiful and shaped colorful gemstones. 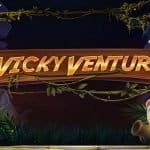 The game includes options such as “Quick bet” which can be used to set the coin size which ranges from 0.5 to 100 per spin, start button, which can be used to start the reels in motion, the “auto Play” option could be used to turn the reels in motion without any mid interruption. Minimum and maximum coins per line for this slot are 1. This slot offers a jackpot of 500 coins on your total bet and return of player percentage RTP is 96.75%, which is awesome. So, before you start playing at this slot, you should adjust your coin size and play option. The game contains wild and bonus symbols as well. There are three world wild symbols in this slot. The world one will provide you 10 miners lamp wild symbols and in world two you will get lolly pop wild symbols spreading across the screen, while in world three you would receive up to 8 spell book sticky wilds which will be added to the grid and will remain there as long as more matches continues. If you collect 20 or more gems in a single spin, you would activate crystal charge bonus feature. There are total 4 charges available in this bonus feature. The first one is Nova Blast charge. This charge will make one gem explode and hence will destroy all adjoining symbols at once. Just like this charge 3 more charges are crystal wrap will pick one symbol randomly. The light beam will also blast one symbol with a ray of light and the last charge i.e. the chain lightning will join two opposing corners.